The SR3647 Rack Server has a Xeon Scalable Processor (Purley Series - up to 20 cores and 40 threads) and supports up to 512GB of DDR4 RAM. This 2U Rack Server has 6 hot swappable hard drive bays for mission-critical reliability. 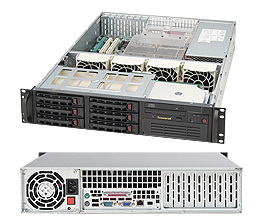 The SR3647 Server combines powerful performance, power efficiency and reliability. 2U Chassis Rails. Outer slides extendable length: 28.25" to 33"